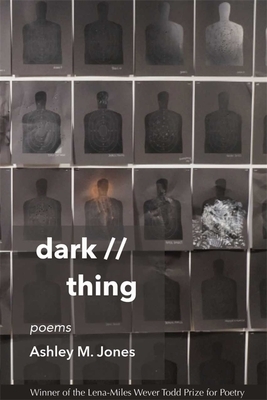 dark // thing is a multifaceted work that explores the darkness/otherness by which the world sees Black people. Ashley M. Jones stares directly into the face of the racism that allows people to be seen as dark things, as objects that can be killed/enslaved/oppressed/devalued. This work, full as it is of slashes of all kinds, ultimately separates darkness from thingness, affirming and celebrating humanity. Ashley M. Jones, a faculty member in the creative writing department of the Alabama School of Fine Arts, received an MFA in Poetry from Florida International University. Her debut poetry collection, Magic City Gospel, won the silver medal in poetry in the 2017 Independent Publishers Book Awards. A winner of the 2015 Rona Jaffe Foundation Writer's Award, Jones authored poems appearing or forthcoming in a number of publications, including the Academy of American Poets, Tupelo Quarterly, Prelude, Steel Toe Review, Fjords Review, Quiet Lunch, Poets Respond to Race Anthology, and The Harvard Journal of African American Public Policy.